A cardinality constrained knapsack problem is a continuous knapsack problem in which no more than a specified number of non-negative variables are allowed to be positive. This structure occurs, for example, in areas such as finance, location, and scheduling. Traditionally, cardinality constraints are modeled by introducing auxiliary 0-1 variables and additional constraints that relate the continuous and the 0-1 variables. We use an alternative approach, in which we keep in the model only the continuous variables, and we enforce the cardinality constraint through a specialized branching scheme and the use of strong inequalities valid for the convex hull of the feasible set in the space of the continuous variables. To derive the valid inequalities, we extend the concepts of cover and cover inequality, commonly used in 0-1 programming, to this class of problems, and we show how cover inequalities can be lifted to derive facet-defining inequalities. We present three families of non-trivial facet-defining inequalities that are lifted cover inequalities. Finally, we report computational results that demonstrate the effectiveness of lifted cover inequalities and the superiority of the approach of not introducing auxiliary 0-1 variables over the traditional MIP approach for this class of problems. This research was partially supported by NSF grants DMI-0100020 and DMI-0121495. An expanded version of this report can be found in . M.W.P. 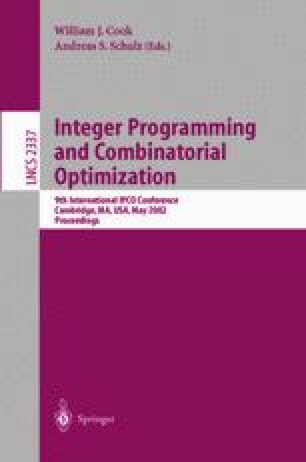 Savelsbergh, “Functional Description of MINTO, a Mixed INTeger Optimizer (version 3.0),” http://udaloy.isye.gatech.edu/mwps/projects/minto.html.